Professional gun from heavy duty aluminum, for easy sealant applications. It features a heavy duty spring loaded trigger and mechanical assist. It accepts sealants in both cartridge or ‘sausage’ forms. Suitable for applying polyurethane sealants, acrylic caulking, and grouts fortitied with the addition of an emulsion additive. It can be used for grouting decorative bricks, stone, cotto etc. 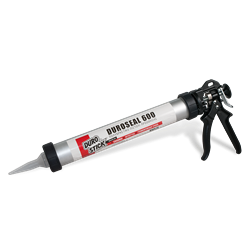 Use it also to apply the injectable resin D-33 of DUROSTICK into cracked concrete columns. REPLACEMENT DUROSTICK NOZZLES are also available for various applications.